MANCHESTER, England (AP) — Manchester City rested many of its best players and was still too strong for Cardiff in a 2-0 win that lifted the defending champions back to the top of the Premier League on Wednesday. 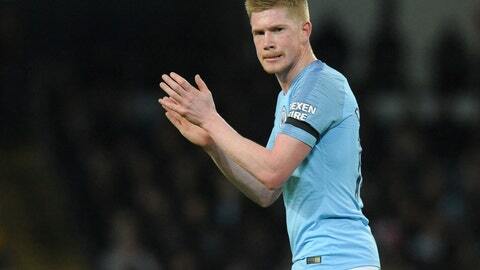 De Bruyne set City on its way in the sixth minute by running onto Aymeric Laporte’s through-ball and driving a left-footed shot into the roof of the net from an acute angle. It was like shooting practice in the second half, with 18-year-old midfielder Phil Foden — making his first league start — hitting the post among City’s best chances. Guardiola was particularly impressed with Foden, who captained England to the Under-17 World Cup title in 2017 and is regarded as one of the country’s best young talents.